The challenges of physician alignment are exponentially more complicated today than in recent years. With the (second) wave of practice acquisition and integration well underway, many organizations struggle to visualize a financially-sustainable, value-added long-term strategy for physician alignment. Surprisingly, the employment model continues to be the main focus of healthcare organizations. There are, however, many alternatives to this approach. Traditional models, while in many markets still the standard, are largely economic in nature, driving both referrals and volume. These models are often accompanied by limited accountability or demonstrable quality improvement. Physician alignment approaches of the future engender both an increased level of accountability and engagement between organizations and physicians to manage care and improve outcomes and efficiency. 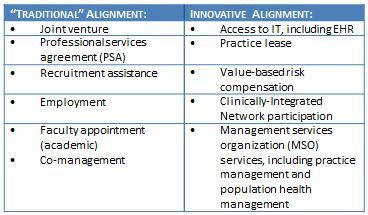 To be fair, the “traditional” models of physician alignment are still relevant, particularly if they are available in addition to those “innovative” approaches as a full complement of physician services offerings with which to approach the market. An organization that offers physician choice in alignment approaches, and one that makes the alignment and integration process seamless to the physician(s) and practice will have the competitive advantage in the market. Offering this level of structure and support for physicians often has important organizational implications, including increased need for coordination and centralization of physician services across an enterprise. Historically, various hospitals, departments, or other organizational entities were able to employ, contract, or form other types of relationships with individual physicians or groups, without a centralized approval or vetting process. Many organizations are beginning to employ a “centralized physician services” approach to organizational design, aligning all physician employment, alignment, and, in the case of academic medical centers, faculty activity under one leader in the organization. This model has proven impactful in coordinating both internal physician resources as well as presenting a unified physician brand externally. A new era healthcare organization must leverage its physician network across all sites and locations to achieve the level of integration needed to fully accept a level of risk that will be required in a post-reform environment.